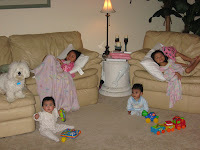 With 4 kids, it's always active around here. 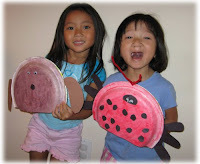 Kya and Autumn love to make puppets. Here are some of the latest. 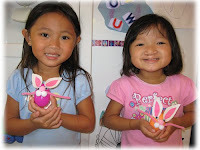 Easter Eggs on popsicle sticks and some paper plate puppets that took an entire day to paint! The girls started AWANA this past fall and are in the Cubbies group. The Cubbies were having boat races. 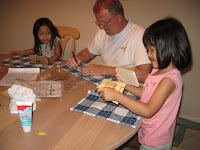 Dad helped Kya and Autumn build and design a boat for the Float-A-Boat Regatta. And, relaxing does happen around here from time to time, which we are always thankful.